Preheat the oven to 110c, gas mark ¼. Use a Microplane or fine grater to zest the oranges. Place the zest in a deep, parchment-lined roasting tray and place in the preheated oven for 20 to 25 minutes or until the zest is dry. Shake the tray every 5 minutes to ensure the zest dries evenly. Allow to cool. Using a food mixer fitted with the whisk attachment or a hand-held electric whisk, cream the butter for 15 minutes until light and creamy. Reduce the speed to low and add the Cointreau a little at a time until it is completely incorporated. Place the mixing bowl in the fridge for 10 minutes then remove and whisk for an additional 15 minutes. Using teaspoons, make a quenelle of butter (see picture) and place it on top of a warm slice of Christmas pudding. Sprinkle some of the dried orange zest on top. 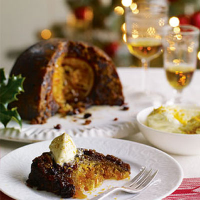 Make this on the morning of Christmas Day and keep cool in the fridge. The zest can be dried in advance and kept in an airtight container until needed.